In this lesson, students explore different types of software including: custom written, off the shelf, open source and proprietary software. Start by showing students the following video from Stephen Fry in which he talks about free software. Explain to students that the software in the previous clip is referred to as open source software and that this is just one of several ways in which we can source software. Explain that some software, such as open source, is free and that some software can be changed to suit the users needs. Also explain that, if a piece of software doesn’t already exist, we can pay to have it custom built specifically for our needs. 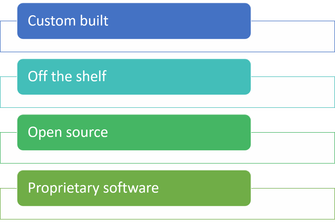 Explain that, in their notes, students should compare custom built to off the shelf software and open source vs. proprietary software. Q.1. Karen wants to use handheld computers to take customers’ orders in her restaurant. She is thinking of using custom written, open source software. * The quality of written communication will be assessed in your answer to this question. Pose a question to the whole class e.g. Explain what is meant by custom written software. What is Open Source? - This introductory video explains what open source software actually is, why it matters, and throws in a bit of history as well.